All canceled reservations received 21 or more days prior to arrival are subject to a 10% cancellation penalty. Reservations canceled within 20 days of the scheduled arrival date are subject to a 100% penalty and are responsible for the entire stay and will forfeit all payments. The farm is located at an altitude of 1,010 m, just outside the charming village of Pavliani, which marks the entrance to Oiti National Park. Set in a region of striking contrasts and spectacular landscapes, Vasilikia Mountain Farm & Retreat is home to two of the country’s oldest national parks and highest mountains. Serene lakes, a diverse array of rivers and a picturesque coastline, and the prefectures of Fthiotida and Fokida in central Greece comprise a harmonious mosaic of stunning vistas, quaint villages and historical monuments that stand as testament to Greece’s glorious but turbulent past. This is a place of outstanding natural beauty where traditions and customs remain very much alive. A place where visitors have the unique opportunity to directly experience the wealth of cultural heritage the area has to offer, against a backdrop of incomparable scenery. A thrilling travel experience awaits those wishing to uncover the secrets of this ancient land as they discover forests steeped in mystery, remote snow-capped peaks, rivers that inspired myths and habitats rich with wildlife, all through a wide range of rewarding activities. Airstream Land Yacht is a shiny trailer, perfect for two lovebirds. This unit features a lounge area, dinette, queen size bed, hanging wardrobe, storage bins and drawers, and a bathroom with shower. 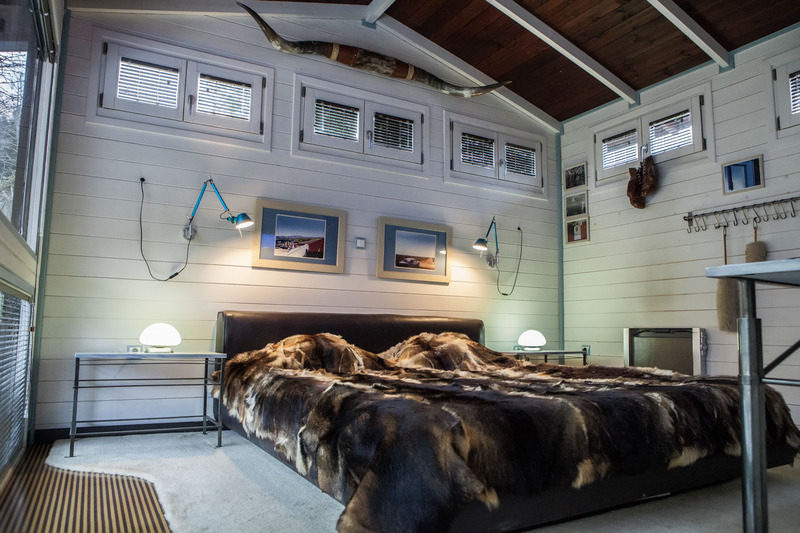 This fully decorated cabin sleeps two guests comfortably on a king size bed. The unit has a seating area, two leather loveseats, armchair, a separate kitchen space, bathroom with a tub, and a wardrobe with hanging rail racks. This quaint cottage sleeps up to 6 guests comfortably on three king sized beds, one on the ground floor and the other two beds in the attic room. There is a bathroom with shower conveniently located on the ground floor. Fully furnished and decorated wood and tone cottage with private porch. Huck is a two story cottage built out of stone and wood. The ground floor features a sitting area, divan, king size bed, drawers, and a bathroom with a bathtub. The second floor is an attic room with sitting area, drawers, and a king size bed. The spacious porch is furnished with patio chairs and tables. Great for a large family or small group, this cabin sleeps up to 6 guests. The ground floor has a sitting area, two sofas, two armchairs, two rocking chairs, separate kitchen space with butcher block work island, a dining area, full bathroom with a tub, and one bedroom with two twin beds and cupboards. The attick room has two twin beds, a couch, and a hanging wardrobe. Complimentary espresso and filter coffee, tea, sugar (white, brown), evaporated milk, olive oil, vinegar, salt, pepper.